← Does your actions speak?? Tea- a drink in our day to day life. Many of us cannot think about starting a day without a sip of hot refreshing tea. I am also one of them. Earlier in my childhood, I was aware only about regular Indian masala tea, black tea, lemon tea (this I tasted first time in Munnar). Then I shifted to Dubai, UAE and I was introduced to ‘Sulemani‘ – a light black tea, where you do not add as much as tea powder as you add to normal tea. Sulemani has got its own ingredients and a recipe. With passing time, I came to know about camomile, jasmine, green and so many other varieties of tea and different ways to make it. Today I am not going to discuss on varieties of tea, but I am going to tell you people about my experience of tasting 22 carat Gold Tea. Yes, you all read it correct- you can drink gold. I read this news and desperately wanted to taste it. And here was my chance, after dinner my husband says let’s go to taste the tea.. Mocca Art cafe is serving it in Downtown Dubai. This cafe is recently opened, has a quite ambiance. The moment we entered in the cafe, one smiling attendant approached us, made us sit comfortably and asked us what we would like to have. Without even a second, I replied Gold Tea. I couldn’t hide my excitement to taste it. A tea was served in glass kettle, glass cup n saucer and yes, with a timer. The kettle was put on a stand and it is warmed with a tea light candle below. I was surprised to see that a tea is served with timer. I had never seen this before. It is called as Perfect Tea Timer, which read 3 Minutes for Light tea, 4 minutes for Medium Tea and 5 minutes for Strong Tea. The lady immediately said that this tea needs to be drink after 5 minutes. I impatiently waited for five minutes and then poured the tea in my cup. It had soothing aroma and rich in taste. The color of the tea was also golden as seen in the kettle above. 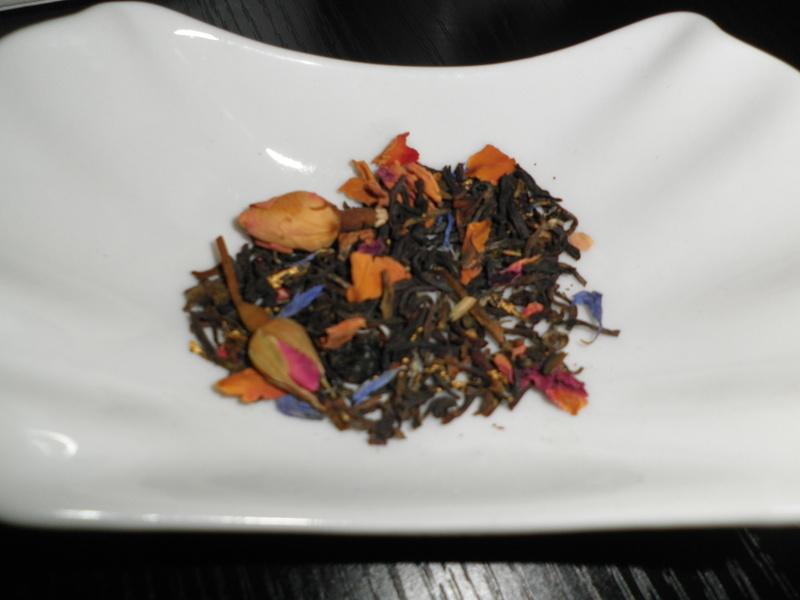 We had been served with additional tea leaves if we wish to use it for some more tea. When I have been served with these leaves, I immediately tried to look for gold particles and bingooo, I found some tea leaves rolled in gold. After having few sips we called for menu of the cafe. We found some other different recipes which were looking tempting. But alas, I just had my dinner so I pacified myself saying next time for sure to try some different variety of tea and one of those recipes. Aside | This entry was posted in This is Home. Bookmark the permalink.